Yesterday, Edifier introduced its e10 Exclaim speaker system. The slim duo of sound sticks is bi-amped, which – even for techies in training – should sound pretty awesome. The basic benefit of such a system is that it protects against clipping (speaker overload) and reduces distortion. A trained ear helps to appreciate the difference, but there most certainly is a difference. 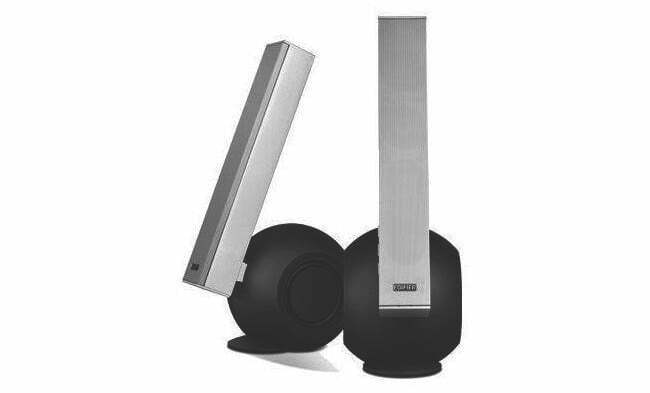 The e10 system features six active internal speakers and four passive radiators. Two of the radiators are found in the midrange/tweeter housings, and are used to aid efficiency and dynamic range, while the other two are used to bolster deep bass and woofer performance. A 3.5 mm auxiliary cable (included) makes the e10 compatible with most devices, including computers, televisions, and mobile devices. For our part, we appreciate how the dual speaker system fits into the computer aesthetic, as the slim face fits nicely with the clean, modern look that’s fast becoming the norm. We can also appreciate the technical design points, though specs are rarely a reliable indicator of sound quality. No word yet on a review but if you’re not familiar with the brand, check out this review of another Edifier product. Edifier’s e10 Exclaim speakers are available now at their website for $100.